Situated away from the most Heathrow hotels except the Novotel it’s like being at a quiet resort. The hotel is 2m(3.2km ) from Heathrow Terminals 1,2 and 3 a short ride on the Hoppa bus(H1) or taxi, there are no free buses that go near the hotel. Hoppa prices £8 return each or taxi would be around £14 each way. Catch the H51 hoppa bus if your traveling to or from Terminal 5. Getting there by car, from the M4 take the exit at junction 4 then the A408 to West Drayton. After the interchange the London Heathrow Crowne Plaza is on the left. The local village Sipson is about 15 minutes walk away which has a few pubs and restaurants. The village may however disappear when Heathrow’s 3rd runway s built. Recently refurbished the 458 bedroom Crowne Plaza is the hotel to come to if you are looking for luxury with its onsite leisure facilities. 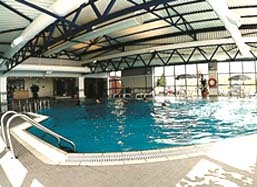 The hotel has a large swimming pool, gym sauna and hot tub to put you in a total relaxed state. The range of leisure facilities continue with a 9 hole golf course, beauty therapy and sunbed although these are chargeable. A children’s playroom is has just been added to the range of facilities to keep the kids out your hair. BedroomsComfortable, modern and spacious bedroom allow you to feel completely revatilised after sleeping in one the sumptuous beds. All rooms offer air conditioning ad high speed internet satellite tv , mini bar, coffee and tea maker facilities. The conference facilities at the hotel offer rooms for up to 200 participants, with 23 meeting and conference rooms available. All of the conference rooms include WiFi and natural day light. Dine in style at this chic French restaurant with stunning décor, elgantly served food to put you in the holiday mood before you even go. Popular with couples, business diners, and anyone who appreciates inventive, c ontemporary and multi-cultural cuisine. Orwell’s Bar: Serves Lunch and Dinner and is open 24 hours a day. A choice of hot and cold drinks and snacks . Open 5.00 – 1.00 except Sundays. The Crowne Plaza has 900 parking spaces and the hotel can be booked on a room only or a parking package of 8 or 15 days parking included with your stay or you can park overnight at the discounted rate of £12 per day for residents and £25 for non residents for 24 hours. An hourly rate is also avaialble for non residents at £2.00 per hour for up to 4 hours the full charge will come into effect.